DC alternators (like generators) change mechanical energy into electrical energy by the process of electromagnetic induction. In general, DC alternators are lighter and more efficient than DC generators. 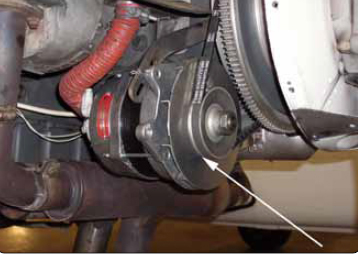 DC alternators and their related controls are found on modern, light, piston-engine aircraft. The alternator is mounted in the engine compartment driven by a v-belt, or drive gear mechanism, which receives power from the aircraft engine. [Figure 1] The control system of a DC alternator is used to automatically regulate alternator output power and ensure the correct system voltage for various flight parameters. DC alternators contain two major components: the armature winding and the field winding. The field winding (which produces a magnetic field) rotates inside the armature and, using the process of electromagnetic induction, the armature produces a voltage. This voltage produced by the armature is fed to the aircraft electrical bus and produces a current to power the electrical loads. Figure 2 shows a basic diagram of a typical alternator. The armature used in DC alternators actually contains three coils of wire. Each coil receives current as the magnetic field rotates inside the armature. The resulting output voltage consists of three distinct AC sine waves, as shown in Figure 3. 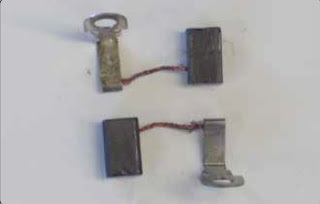 The armature winding is known as a threephase armature, named after the three different voltage waveforms produced. Figure 4 shows the two common methods used to connect the three phase armature windings: the delta winding and the Y winding. For all practical purposes, the two windings produce the same results in aircraft DC alternators. The invention of the diode has made the development of the alternator possible. The rectifier assembly is comprised of six diodes. This rectifier assembly replaces the commutator and brushes found on DC generators and helps to make the alternator more efficient. 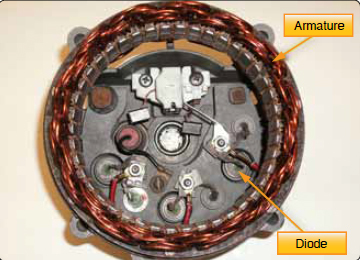 Figure 6 shows the inside of a typical alternator; the armature assembly is located on the outer edges of the alternator and the diodes are mounted to the case. 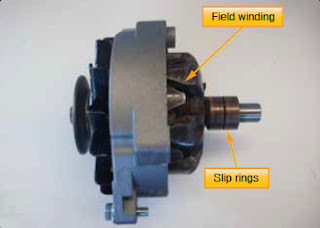 The field winding, shown in Figure 7, is mounted to a rotor shaft so it can spin inside of the armature assembly. The field winding must receive current from an aircraft battery in order to produce an electromagnet. Since the field rotates, a set of brushes must be used to send power to the rotating field. Two slip rings are mounted to the rotor and connect the field winding to electrical contacts called brushes. Since the brushes carry relatively low current, the brushes of an alternator are typically smaller than those found inside a DC generator. [Figure 8] DC alternator brushes last longer and require less maintenance than those found in a DC generator. The alternator case holds the alternator components inside a compact housing that mounts to the engine. Aircraft alternators either produce a nominal 14-volt output or a 26-volt output. The physical size of the alternator is typically a function of the alternator’s amperage output. Common alternators for light aircraft range in output form60–120 amps. Voltage regulators for DC alternators are similar to those found on DC generators. The general concepts are the same in that adjusting alternator field current controls alternator output. Regulators for most DC alternators are either the vibrating-relay type or solid-state regulators, which are found on most modern aircraft. Vibrating-relay regulators are similar to those discussed in the section on generator regulators. As the points of the relay open, the field current is lowered and alternator output is lowered and vice versa. Solid-state regulators for modern light aircraft are often referred to as alternator control units (ACUs). These units contain no moving parts and are generally consideredto be more reliable and provide better system regulation than vibrating-type regulators. Solid-state regulators rely on transistor circuitry to control alternator field current and alternator output. The regulator monitors alternator output voltage/current and controls alternator field current accordingly. Solid-state regulators typically provide additional protection circuitry not found in vibrating-type regulators. Protection may include over- or under-voltage protection, overcurrent protection, as well as monitoring the alternator for internal defects, such as a defective diode. 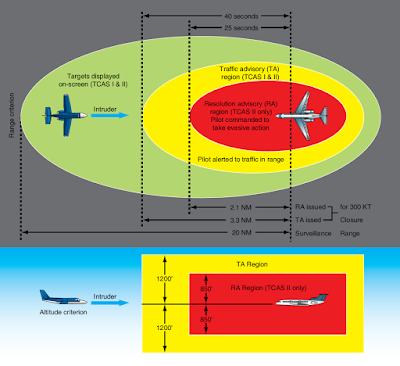 In many cases, the ACU also provides a warning indication to the pilot if a system malfunction occurs. 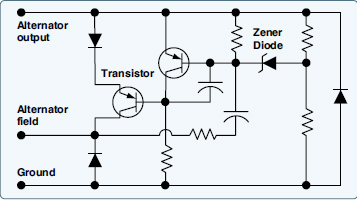 A key component of any solid-state voltage regulator is known as the zener diode. Figure 9 shows the schematic diagram symbol of a zener diode, as well as one installed in an ACU. The operation of a zener diode is similar to a common diode in that the zener only permits current flow in one direction. This is true until the voltage applied to the zener reaches a certain level. At that predetermined voltage level, the zener then permits current flow with either polarity. This is known as the breakdown or zener voltage. 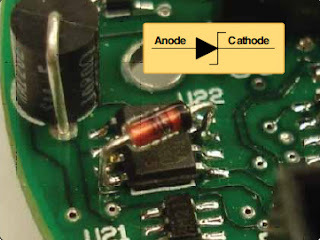 As an ACU monitors alternator output, the zener diode is connected to system voltage. When the alternator output reaches the specific zener voltage, the diode controls a transistor in the circuit, which in turn controls the alternator field current. This is a simplified explanation of the complete circuitry of an ACU. 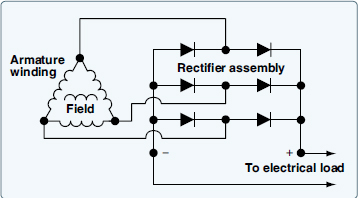 [Figure 10] However, it is easy to see how the zener diode and transistor circuit are used in place of an electromechanical relay in a vibrating-type regulator. The use of solid-state components creates a more accurate regulator that requires very little maintenance. The solidstate ACU is, therefore, the control unit of choice for modern aircraft with DC alternators.